High Road Strategies, jointly with the Millennium Institute, has produced two new studies on the economic impacts of H.R. 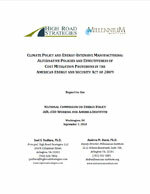 2454, the American Clean Energy and Security Act of 2009 (ACES) on energy-intensive trade-exposed industries (EITE). H.R. 2454 was sponsored by U.S. Representatives Henry Waxman (D-CA) and Edward Markey (D-MA), and passed by the U.S. House of Representatives on June 26, 2009. The studies, examined the impacts of ACES on selected EITE manufacturing industries at the 5 to 6-digit NAICS levels—iron and steel and ferroalloy products, primary aluminum and secondary smelting of aluminum, paper and paperboard mills, alkalies and chlorine, and petrochemicals. 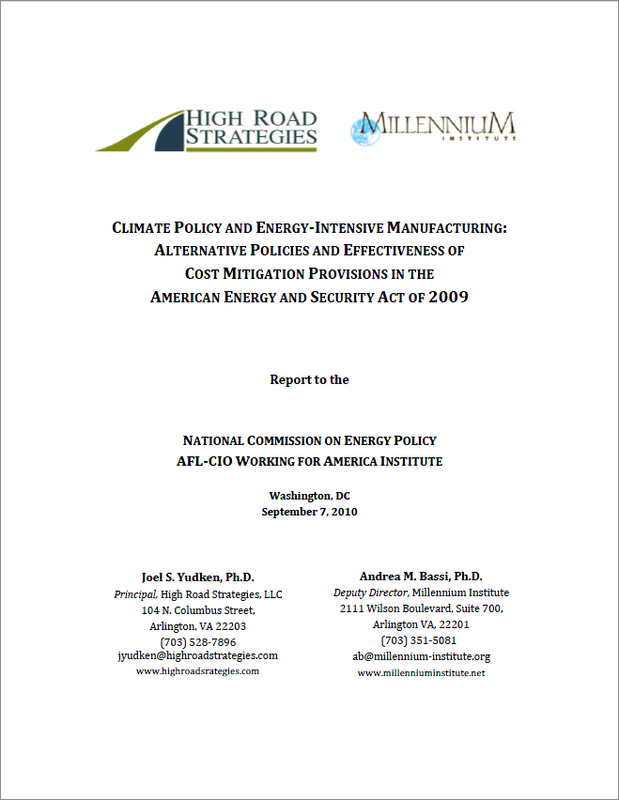 This work updates the earlier study by the HRS-MI team that constructed and employed the Integrated Industry-Climate Change Model (II-CPM) to analyze the impacts of the Lieberman-Warner Climate Security Act of 2007 (S. 2191) on these same industries (see Climate Policy and Energy-Intensive Manufacturing: Impacts and Options project). summarizing the results of this work was released by the Environmental Defense Fund, which funded this part of the project, in February 2010. 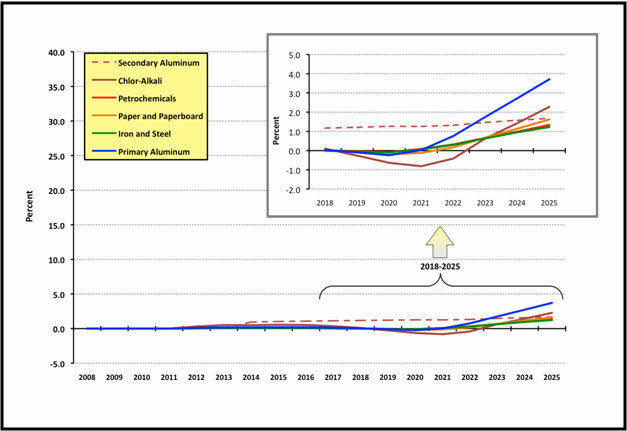 In the second study, the HRS-MI team built on this work, modeling alternative policy scenarios identified in a Department of Energy’s Energy Information Administration’s evaluation of H.R. 2454. These were based on different assumptions regarding alternative electricity generation costs and the availability of international offsets, as specified in the bill. It also evaluated various options, based on the border adjustment mechanism (International Reserve Allowance Program) stipulated in the legislation. The border adjustment mechanism would require that foreign producers from countries with no comparable climate mitigation policies be subject to tariffs reflecting the GHG emissions-intensity of their U.S. imported goods. 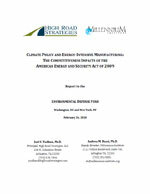 A report summarizing the findings of the second study was released in September 2010. 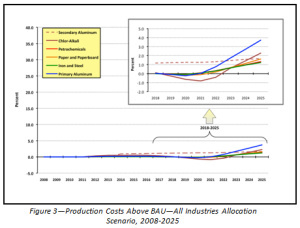 The study confirmed that regardless of the policy case or industrial sector, output-based rebates would effectively mitigate the costs of carbon-pricing for EITE industries through 2020-2022. 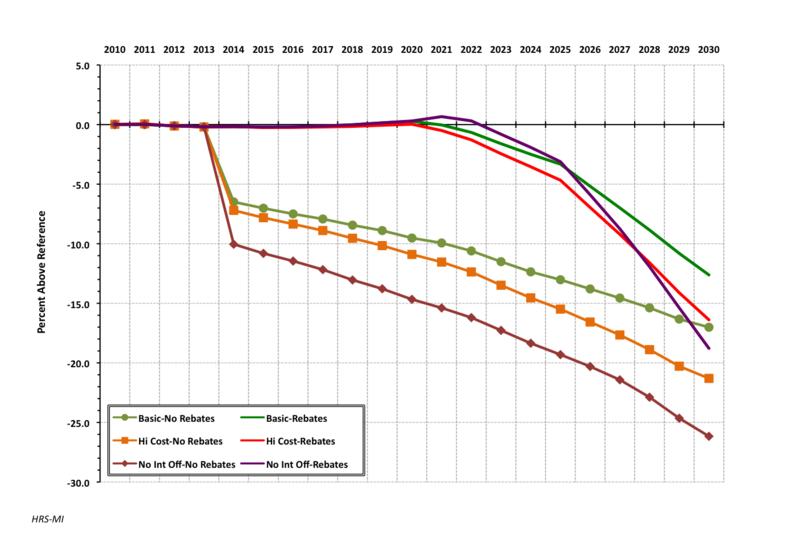 But as the rebates start phasing out after 2020, if non-carbon electric power alternatives (nuclear power, carbon capture and storage, biomass) are much more expensive, or if international offsets were not readily available—which may be more realistic assumptions than those in the base case policy scenario—the economic impacts on EITE industries would be greater, especially after 2025. 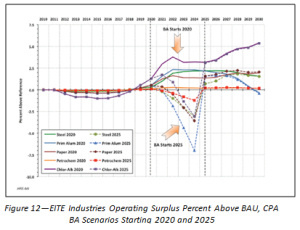 That is, the predicted economic impacts in the base policy case analyses could underestimate the impacts that EITE industries would experience if the ACES were actually enacted. 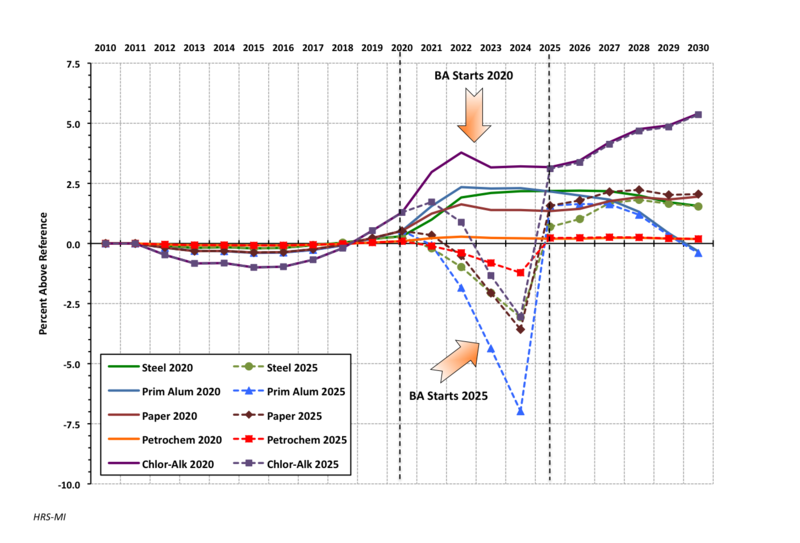 The study’s findings, however, were mixed concerning the effectiveness of the border adjustment (BA) measure in reducing cost impacts after 2020, largely because of uncertainties about how the measure would be designed and applied. 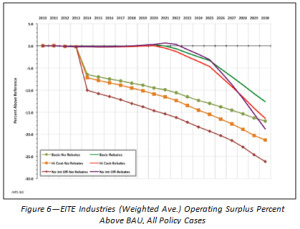 Because countries that have complied with carbon reduction agreements account for the overwhelming largest share of U.S. imports, the BA measure would not be especially effective in offsetting the rising allowance costs of U.S. EITE manufacturers after the rebates start to fade. 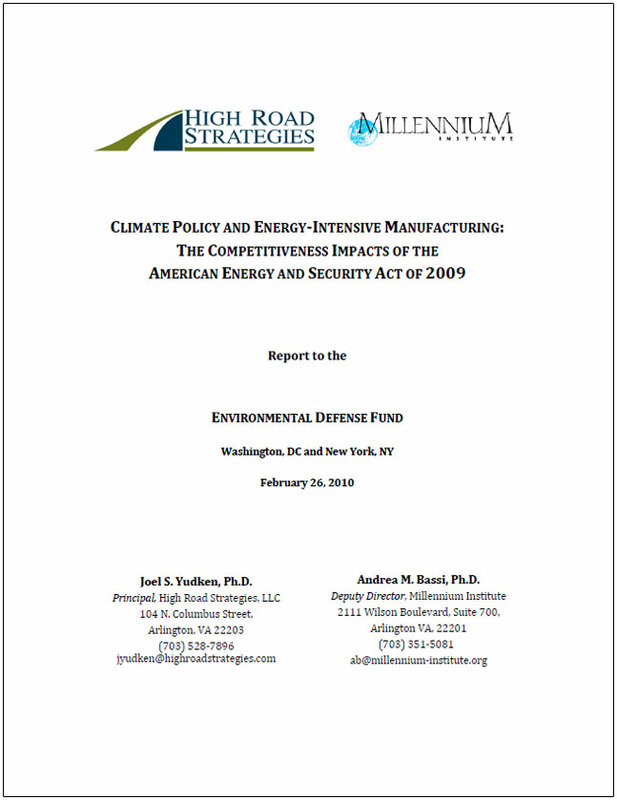 After its release, EDF met with several Senate offices to share the first report. High Road Strategies also has given presentations to a wide range of groups, reporting on the results of the both new reports as well as the earlier NCEP-sponsored study. This includes presentations at an international climate policy and trade conference in New Delhi, India and the Federal Economic Development Forum of the International Economic Development Council, in Washington, DC, and to economists and policy experts at the Department of Commerce’s Office of Competition and Economic Analysis, the U.S. Environmental Protection Agency, and the World Resources Institute, among others.